TTouch was developed by Linda Tellington-Jones, originally on horses, but now it is used with all animals. It is a way of working with animals with no threat or force. The non-habitual touches and movements release tension and help physical and emotional balance. The two parts of TTouch work are bodywork and groundwork. It has an effect on the neural pathways of the body, giving enhanced ability to learn and co-operate. It opens up new channels of communication allowing animals to learn new ways to behave, which allows previous negative behaviours to be left behind. Animals learn to judge each new situation as it happens, rather than just reacting to it. Using touch ‘mindfully’ and ‘with intent’ is different to normal stroking, which is often done in an absent minded way. People observe and focus on interaction with animals when using TTouch, so there is a constant adaptation to create beneficial interaction. By acknowledging and responding to calming signals you are allowing the dog to demonstrate concern or discomfort about what is happening to them. Animals (and humans!) get locked into certain behaviour patterns which then become purely habit. They are really just reacting with no thought behind the action and this prevents other behaviours from being considered. Anxiety and fear can also cause habitual responses to certain situations and prevent conscious thought. By relaxing dogs and giving them confidence it enables them to deal with life in a more balanced way. TTouch gives self-awareness to help them be aware of what they are doing, as they do it. Alternative behaviours then become an option as the dog is focusing on what is happening, instead of simply reacting without thought. Think of it as giving new information to the body and mind, which can then help them to feel differently, giving them more options to behave differently. These exercises encourage dogs to focus, which is especially useful during behaviour training. Slow, purposeful movement over different surfaces, textures and different types of objects enables dogs to be aware of how they are moving and what they are doing in that moment. Since most dogs spend much of their time doing several things at once, they rarely get the opportunity to focus on doing one thing well and remembering it. How can slow focused movement help dogs? These exercises are not to be confused with agility training or other activities. Whilst they may use some similar equipment, the aims are completely different. However, this work is invaluable in preparing a dog for agility training or any other fast or active sport. Good awareness of all the limbs and body positioning when moving enables better and more efficient movement at speed. Before a dog can move well at speed they have to be able to do it well at a slow pace. If they learn accuracy at a slow speed it is then easier to get good movement skills at a fast speed. This enables them to be faster, more accurate and less likely to injure themselves because they are moving really well. Poor posture can be become habitual or dogs can be born with certain conformation problems, some mild and some more severe, which can cause poor movement. Injury and pain can cause an animal to adopt a poor posture to protect the injured area and this may go on after the injury has healed and the pain has gone. Posture also dictates behaviour and certain postures and movements accompany a particular state of mind. Have you ever tried to laugh and be angry at the same time? To be angry you need to adopt a stiff, confrontational posture with a frown on your face and probably a very tense mouth. To laugh you need a relaxed posture and you use totally different muscles in your face. To change behaviour it is necessary to change posture and we can do this for dogs by using touches and groundwork exercises to relax them and give flexibility. Simply walking a dog over slightly raised poles on the ground means they need to lower their head to do this. With their head lowered it is much harder to be confrontational and easier to not react to something which is usually a trigger.Walking dogs over and through different pieces of simple equipment enables them to move differently and therefore feel different. Using touch and movement you can suggest a different posture and therefore a different emotional state which will accompany the new posture. Ease of movement and a confident, calm posture = a confident attitude and feelings of self-control. 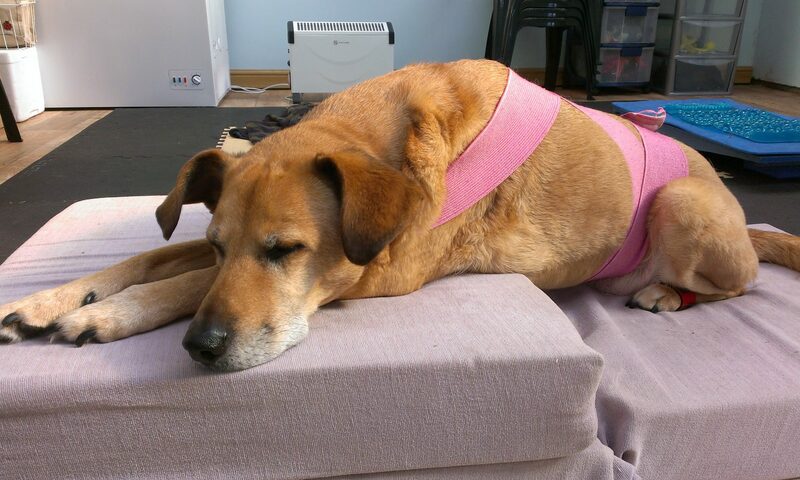 By helping a dog to move easily and freely you can improve the way they feel.